Okay, so here we go, day 2. Day 1 I zipped through using the squats and crunches, but today with the pushups and pullups, I have to use my make shift sports strap, and I’m unsure of how it will hold up. As I already have my account created, I just have to sync these two apps with my already created GymFu account, go through the introductions and instructions, and its away we go! These two apps give you the option of either having the phone be on the inside or the outside of your bicep, pointed down. I chose inside my bicep hoping it would be easier to push start and be ready to go. Plan was good with the pushups, not as well on the pullups, but more on that below. Training works the same as with crunches and squats. I had my baby girl helping me with the pushups, so my initial testing didn’t go so well, and well, I sucked on the pullups, but, I didn’t retake the tests on the first day and I chose not to today, so I go with what I got. I’m doing all this from the aspect of a Dad, so if my baby girl distracts me, well that’s part of it! I started with the pushups, which were no problem. I was able to go through all the motions, had the timing down, so I wasn’t called down on “half” or too fast, and having my phone on the inside of my arm, even with my make shift band, helped me be able to cancel the 120 second break between reps and keep on going through the pushups. Now the embarrassing part. I borrowed my brother’s pullup bar he had when he purchased the P90X workout DVDs. I knew I was in trouble when he bet me I couldn’t do 3 “real” pullups for $100 and I failed, but I went through with it anyway. Setup the bar in a doorway, and went to it. The starting point for the pullups is you hanging from the bar, so you have to push start, then lower yourself and hang until it tells you go. I was able to do 1 and then got called on “half” afterwards. I had to cheat a little to get through all the reps without being called “half!” on them. Something I’m not proud of at all, truly embarrassed to be writing that, but am determined to be improved by the end of the 30 days. After 2 days, I’ve used GymFu’s 4 apps, and am rather impressed by them. For a quick easy workout in my office or upstairs I could easily use these apps more then what I’m using them, but for these tests and reviews, I’m using he apps how they suggest, with resting 48 hrs between workouts. I plan on looking into the battles and leagues after I get my reps up, hopefully this time next week, but now that we’ve gotten over the hump of getting started with the apps, it time really get into them and see what they can do. Okay, so here we go, day 1 of my GymFu experiment. The setup is pretty straight forward. When you open up any of the 4 apps Gymfu offers, you’re welcomed to a Home screen. If its you’re first time using the app, you have a welcome message to read, and if you don’t read it and close the app, the app shows a 1 on it similar to Facebook and your email icons, which leads me to believe that this screen will be a place to receive update messages and such from GymFu.com. Also on this screen will be a graph showing your progress, something that won’t show until you’ve had at least 2 days worth of training on the apps. When you go to create your account, you may either create a new account or given the option to simply connect your GymFu account with your Twitter account, which is what I did. When I did this, I was automatically set to follow @GymFu, and a few moments later, was sent a direct message from GymFu giving me my username, which was based off my twitter name, and a password, which you can easily change from the accounts settings screen. This was a one time event. After creating my GymFu account on the first app, when I went to setup my accounts on the other 3 apps, and they recognized I already had an account to sync with. When you go into the training, before you can start using the app as its intended, you have to go through 4 sections: All about you exercise, All about ‘Fu’, Practice and first test. I’m actually impressed with this as it tells you the proper way to do the exercise your ‘Fu’ is for (squats, pushups, pull-ups, and crunches. ), along with giving visuals as to how you should position your phone, either with your hands or using a sports band (for pushups and pullups). After you’ve be given the walkthrough, you test your ability to understand what the app has told you with a practice run, if you pass the practice run, you get to go to your first test, where it asks you to do as many reps as you can, as to gauge where your first real day of training should start..
Day 1 I zipped through using the squats and crunches, but today with the pushups and pullups, I have to use my make shift sports strap, and I’m unsure of how it will hold up. As I already have my account created, I just have to sync these two apps with my already created GymFu account, go through the introductions and instructions, and its away we go! To be fair to testing these apps for 30 days, I felt like doing everything they suggest. One suggestion you’re given while going through the welcome screens is that you should rest 48 between training sessions, so I’ve split my time between the four apps. Day 1 will be crunches and squats, Day 2 will be pushups and pullups, Day 3 will be resting, and I will follow that pattern for the 30 days. I was honestly unsure of how the apps would work, but after using them I’m fairly impressed. I started with the crunches, which has you hold your phone to your chest, pointed down, with both hands. The program requires you to raise your shoulders to a 30 degree angle. If you do not raise up high enough, its only counted as “half” and if you go through your reps too quickly, then you’re called to slow down. Its not that bad and after once or twice you get the motion and speed down fairly easily. The program splits your training into 5 sets of varying numbers of sets. After each set, you’re given a 2 minute break, which you can choose to bypass or you can sit there and wait. Which, with the small numbers I got started with, I zipped right through the resting periods, except for the last set, which has you do a set number of reps, but then you do as many as you can. I started with crunches, and once I got accustomed to using the app, it was smooth going. I actually messed up somewhat on the test and the beginning, trying to slide the bar notifying I was done, rather then sit still until the app registered me as complete. Basically the way it works is you push ‘Start” on your phone, get settled into and stay in the start position, once the phone registers this and registers you as remaining still, it will begin to count, once you have completed your reps and stay still for a few seconds, the app registers you as complete. My first rep, I got called on for “Half!” but after that it was smooth sailing. And it wasn’t bad having to hold my phone against my chest either. the first step, because it wasn’t registering my thighs being in the proper position, I switched from the strap to my phone in my pocket, which surprisingly worked very very well! The best part about this for me is that it works so well in your pocket, you could easily do the squat exercises at work or somewhere other then home if you wanted. Well, after the first day, I’m impressed with how the apps works, the motion detection and direction were much better then I was expecting. Although the number of reps were not as high as I was expecting or liked, part of that probably stems from me learning the apps functions as I went and being too stubborn to retake the tests. Overall, first day impressions are A’s all around. For an exercise app on your phone, you couldn’t ask for me. I realize this is somewhat a quick zip through, but as I continue to use the apps, I will elaborate and cover more aspects, but as I just started, I simply wanted to cover the bare basics. Lets face it, no one ever has enough time in the day to do everything they want. As you get older, you gain a career, a significant other, children, your responsibilities to other people begin to overtake your responsibilities to yourself, and things slowly slip through the cracks. One that I’m guilty of, more so the past few years, has been my health and weight. Sure, I’ve been determined on more then one occasion to get up and go to the gym. I tell myself how I used to be in great shape, I used to love lifting weights, I can get back to that, I just have to get over the hump of getting started and it’ll be down hill from there. Well, the hump is a bit more of a hill now, it takes longer to get over, and honestly, I always find something that I feel is more important then going to the gym before I get over that hump. Part of my problem, or what I use for the biggest excuse, is my job. My job is somewhat unpredictable in that there are days where I can’t guarantee I’ll be home at a certain time, and once I am home, I want to spend time with my kids, so the later home I get, the smaller the window I have before the kids go to sleep. Things have to be thrown out, so they are! Well through my random browsing, I came across a site; GymFu.com, where they currently offer 4 different apps in the Apple AppStore, all geared towards exercise, all using different techniques, and all being somewhat unique in their approach. What the people at GymFu seem to have done is take the ideas people have now with the WiiFit, using equipment and motion as a means of support in exercising at home, because lets face it, you’re more likely to cheat if you’re at home, and shrunk it into the iPhone, using the device’s accelerometer to read and analyze your motions to determine the accuracy in which you do your exercises. Which honestly, seems like a no brainer in terms of a use for the iPhone, its just something I haven’t come across before. 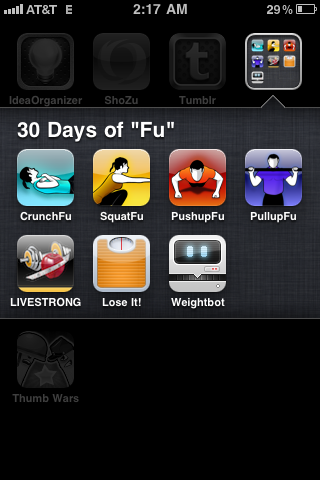 So, I decided, as motivation to get me back into the swing of things exercising, considering I do none currently, and as an excuse to blog more, I’m going to do 30 days of using GymFu’s apps. This will be an extended, real time test and review of the apps. I will weight once a week, follow the apps regimens and exercise, and will keep track of my calorie intake, testing out two apps there as well. So, starting tomorrow, I will record my weight, start keeping track of my calories and will begin using the apps, which let me point out, short of just reading on them, I have not started using them yet. I have not created accounts or anything else, I will start that tomorrow, as a means to begin just like anyone else would.